A fantastic crime thriller, filled with some gripping characters and intense situations. 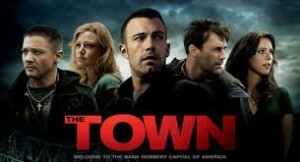 The Town is a Ben Affleck crime movie and by that, i mean a movie not so much starring him, (although it’s got that too), but a movie he directed. A movie he made. Now that’s a much bigger statement than something that he was starring in, because we all know that as an actor he couldn’t choose roles for his life and ended up in more crap than anybody, from reindeer games to gigli to paycheck, he was in a lot of garbage and he knew it. daredevil, the sum of all fears, jersey girl, the list goes on and on. but as a director…well, that’s a whole different story. In 2007, when he made gone baby gone, as his directorial debut, it was like he was reborn again. Suddenly hollywood and the public were giving him a second chance and he was going to make sure not to screw it up again. gone baby gone turned out to be one of the better movies of that year and a truly fantastic crime / film noir movie. Well, with his follow up movie, the town, affleck proves that gone baby gone was no fluke. he has finally found his calling and it is in making movies, not just starring in them. the town is a fantastic movie. it takes place in affleck’s hometown of boston, just like gone baby gone, just like good will hunting the movie the launched both him and matt damon and that they wrote together (ironically that movie was in fall 1997, exactly ten years before gone baby gone). Affleck seems to have found the right place for him, making crime movies about boston, just like scorcese makes them about new york. It’s high praise to be comparing him to scorcese, and he’s certainly got a long way to go to be anywhere near that, but with a track record of two for two, and both of them being really great films, he’s certainly on the right path. The Town is about bank robbers. Sometimes they rob armored trucks. And the movie opens with them pulling off one of these bank robberies, dressed in skeleton masks and knowing every detail about the guards and the bank. they start out in the back of a truck discussing the plan and what they know about the guards involved, and right away you can hear the boston accents and the way affleck is trying to make this movie as authentic (or authenticious, as one character says later ), as possible, mentioning how one of the guards sits down and “cracks the herald,” meaning the newspaper the boston herald. Later on there are references to star market and other boston spots, leading up to the cathedral of boston, fenway park. But long before that, affleck’s character, Doug Macgray, and his crew, rob this bank and take the bank manager, claire (rebecca hall) hostage. Right away we can tell that best friend Jem (jeremy renner) is a loose cannon as he beats up one of the bank managers, but when he grabs claire and takes her along with them, he’s crossing a line. and it becomes a problem when they later read her license and learn that she lives in charleston, only four blocks away from them. Doug says he will handle it and he goes to meet her, planning an accidental meeting at a laundromat. The next thing you know, they are dating. That might sound silly or simple, but doug covers this movie in grittiness and grime so that we get multiple robberies (3 in total, all planned out to a t), and back story involving his mom, dad, and a crime boss known as the florist. And then there’s the fbi man played by john hamm, who is right at home in a role like this, just like he is with playing don draper in tv’s mad men. doug courts and dates claire and actually falls for her, which is not all that hard to believe considering that he is unhappy with the lifestyle he leads and wants to leave it all behind anyway. Claire represents a way out for him. Someone who is better than all this and can help him get away from it. But then there’s his friend, jem, bringing him right back in. The amount of back story in this movie is tremendous, between the story of doug’s parents with the florist, and then the story of how jem went to jail for going to bat for doug. And it’s all handled quickly with affleck the filmaker knowing full well that audiences don’t want to listen to a story, but want to see a story for themselves. the back story is important, but it has to be delivered just right to really hit home, and with the story of his parents in particular, afflack cleverly gives it to us in doses, providing a bit of a mystery with secrets and holes in it. And as the movie goes on, those holes get filled in. Aside from the creative back story and a powerhouse performance by jeremy renner as the best friend (oscar nominated and well-deserved), there’s the action in this movie which is top-notch. 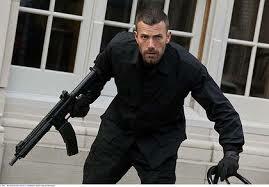 all three bank robberies are fantastic and affleck makes sure that they get better and better as the movie goes on. this crew also gets closer and closer to getting caught. the second robbery, up in the north end, features some fantastic car chases, almost reminiscent of movies like ronin and the bourne identity (some of the better car chase movies put on screen in the nineties and early 2000’s). Doug and his crew are even brought in for a face to face between them and the police. Affleck knows that this one on one conversation is a staple of great crime movies that feature strong leads on both sides of the law. He is probably using heat for reference points, as it represents the very best in bank robber movies from the last few decades. In that movie, deniro and pacino sat down for a conversation and it became the most important scene in the movie. Here, affleck and hamm do something similar. this movie might not be as much of a mystery with twists and turns as gone baby gone was, but it is covered in fun and authentic dialogue that shows affleck knows how to write. just listen to his references to fred flinstone and g. i. joe, and csi, and bones. The interactions between he and jem are fantastic and affleck has fun playing with his relationsip with claire and hiding clues from her such as a tattoo on jem’s neck that could end up giving things away. this is a really great and very smart film, loaded with fantastic plot points and action. While also being a crime movie, it is very different than gone baby gone which was a true mystery. this movie is more of a bank robbery / heist picture and for the second time in a row, ben affleck delivers.